I feel like the way I do 80-column indication in Vim is incorrect: set columns=80. At times I also set textwidth but I like to be able to see and anticipate line overflow with the set columns alternative. This has some unfortunate side effects -- I can't set number for fear of splitting between files that have different orders of line numbers; i.e. < 100 line files and >= 100 line files will require two different set columns values because of the extra column used for the additional digit display. I also start new (g)Vim sessions instead of splitting windows vertically, which forces me to use the window manager's clipboard -- vsplits force me to do set columns every time I open or close a pane, so starting a new session is less hassle. How do you handle the 80-character indication when you want to set numbers, vertically split, etc.? This highlights the background in a subtle red for text that goes over the 80 column limit (subtle in GUI mode, anyway - in terminal mode it's less so). As of vim 7.3, you can use set colorcolumn=80 (set cc=80 for short). See also the online documentation on the colorcolumn option. 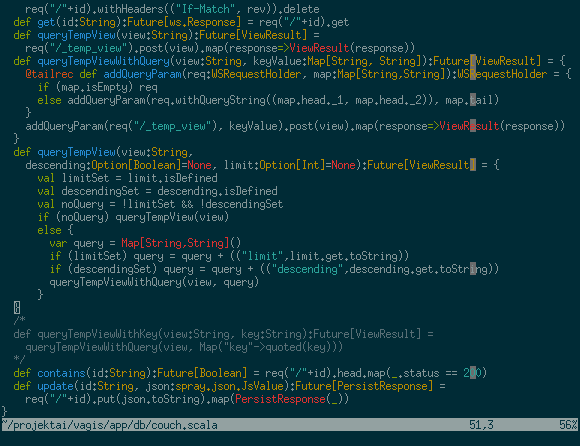 And now VIM will highlight anything that exceed column 80. Cheers! Minimalistic, not-over-the-top approach. Only the 79th character of lines that are too long gets highlighted. It overcomes a few common problems: works on new windows, overflowing words are highlighted properly. Note: notice the FileType scala,java this limits this to Scala and Java source files. You'll probably want to customize this. If you were to omit it, it would work on all file types. Newer versions of vim allow a :set numberwidth=x value, which sets the width of the line number display. I don't really use folding etc, so I wouldn't know about that though. Drawing a thin vertical line is beyond the abilities of a console application though. GVim may allow this (I don't use it, so can't comment there). I'm afraid that you've put constraints on the set of solutions that, well, leave you with the null set. Using :set textwidth=80 will fix all of the problems you mentioned except that you can't easily see the line limit coming up. If you :set ruler, you'll enable the x,y position display on the status bar, which you can use to see which column you're in. Aside from that, I'm not sure what to tell you. It's a shame to lose the number column, fold column and splits just because you have to :set columns=80. That will set up two highlights in every buffer, one for characters in the 8 columns prior to whatever your &textwidth is set to, and one for characters beyond that column. That way you have some extent of anticipation. Of course you can tweak it to use a different width if you want more or less anticipation (which you pay for in the form of loss of syntax highlighting in those columns). Well, looking at the :help columns, it's not really being made to mess with. In console, it's usually determined by console setting (i.e. it's detected automatically) ; in GUI, it determines (and is determined by) the width of the gvim windows. I am not sure what you mean by "see and anticipate line overflow". If you want EOL to be inserted roughly column 80, use either set textwidth or set wrapmargin; if you just want soft wrap (i.e. line is wrapped, but no actual EOL), then play with set linebreak and set showbreak. You can try this to set the window size to allow 80 characters of actual text. This still doesn't work with vertical splits though. This requires vim 7+, 7.3 for relativenumber. Not the answer you're looking for? Browse other questions tagged vim coding-style or ask your own question. How to show vertical line to wrap the line in Vim? Vim different textwidth for multiline C comments? Is it possible to have (at the same time) colorcolumns in vim 7.3 with different colors, using the new colorcolumn option?